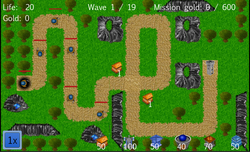 Kingdom Tower defense is a game with 4 different play modes. Every single one of these modes has different settings of rules and thanks to this, game offers longer playability. Normal – After killing an enemy you don’t get any gold, after the end of each wave you gain certain amount. Medium -Objective of this is to sustain all the waves but also acquiring certain amount of gold! Hard – Many more enemies, but as a support your castle generates gold every second, the castle is upgradable.